Energy-efficient stealth device. 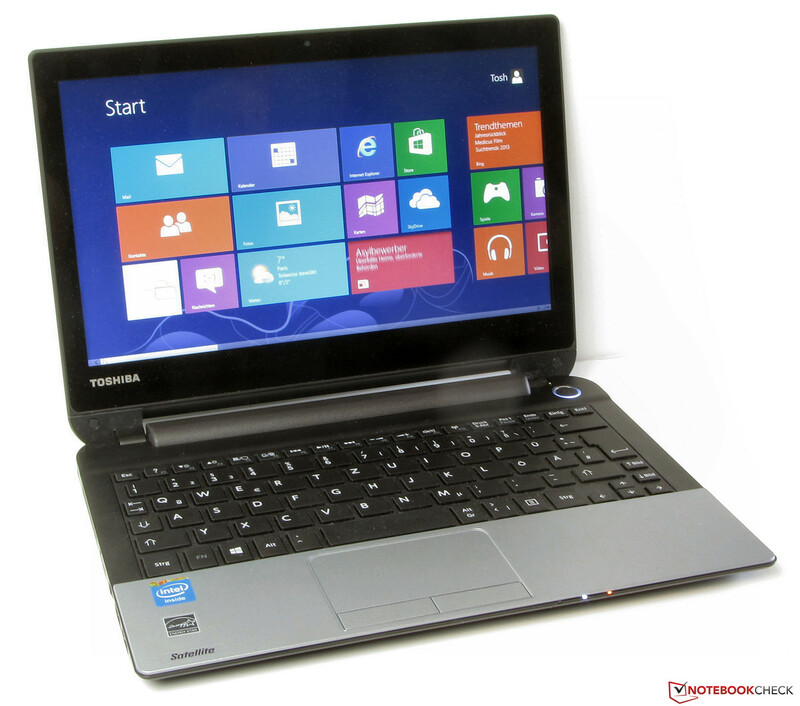 Toshiba's Satellite NB10t-A-101 is an 11.6-inch netbook which comes equipped with a Bay Trail Celeron CPU, a touchscreen, a 500 GB HDD and Windows 8, costing approx. 380 Euros (~$518). 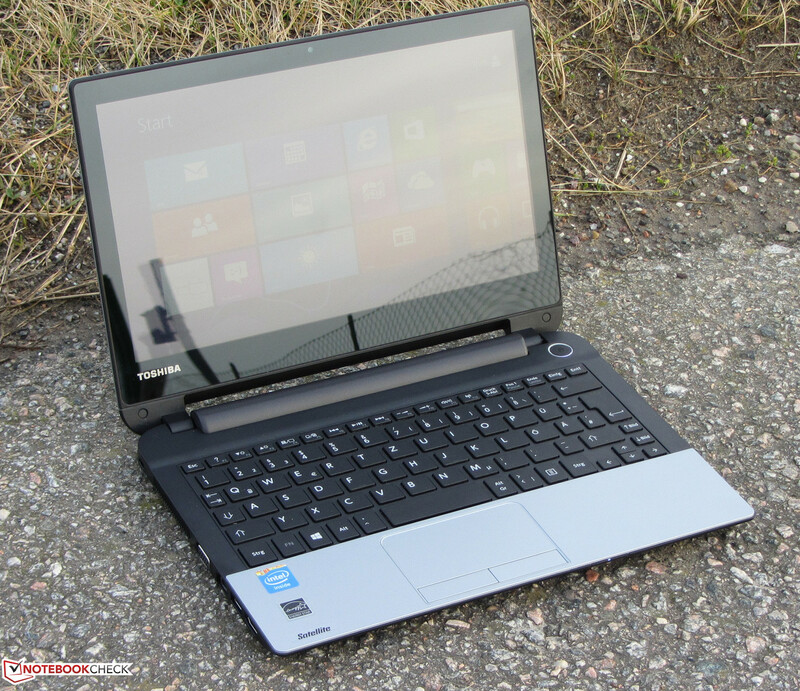 Our review will show whether Toshiba's small notebook is a true bargain. 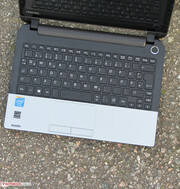 Those who are looking for a small, mobile computer can nowadays choose from not only netbooks and subnotebooks, but also a number of tablets with attachable keyboard docks. 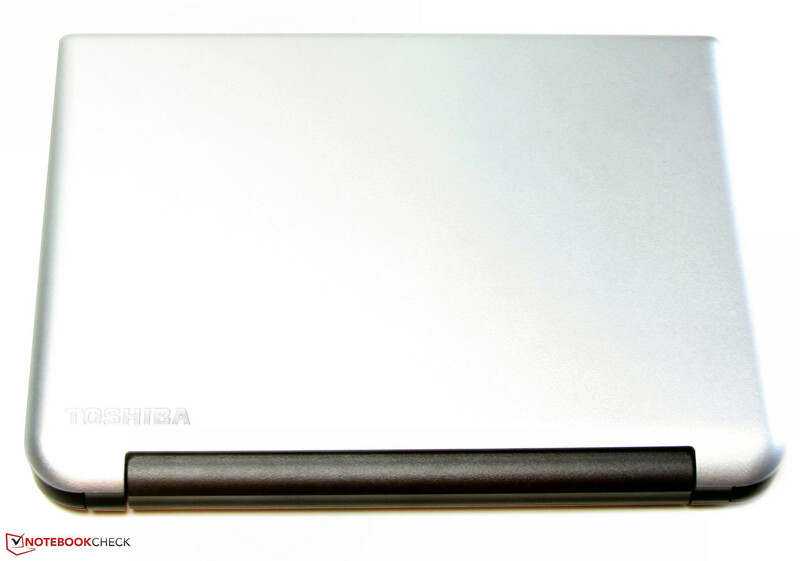 Toshiba's newest entry is an 11.6-inch netbook with a touchscreen. Thanks to the 500 GB HDD and a Bay Trail Celeron CPU, storage space and power efficiency shouldn't be issues. 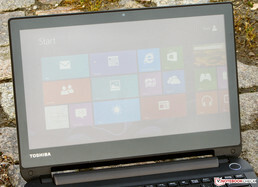 Our review will show whether Toshiba has created a true winner. We are comparing this netbook to two strong competitors, the Acer Aspire V5-131 (Celeron 1017U, HD Graphics (Ivy Bridge)) and the Lenovo ThinkPad Edge E145 (AMD E1-2500, Radeon HD 8240) - neither of them sport a touchscreen. 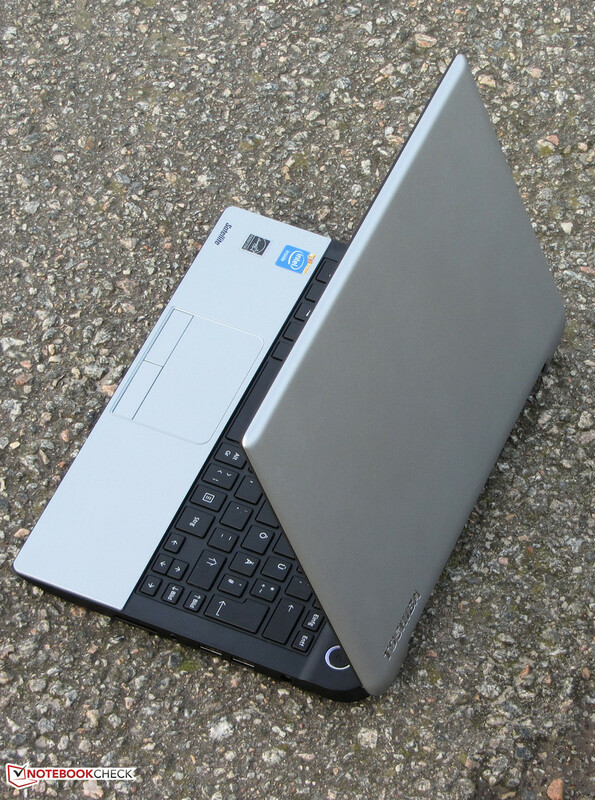 The basic shape of the chassis shouldn't come as a surprise - it sticks pretty close to Toshiba's current design philosophy which has been employed with almost all recent Satellite laptops. 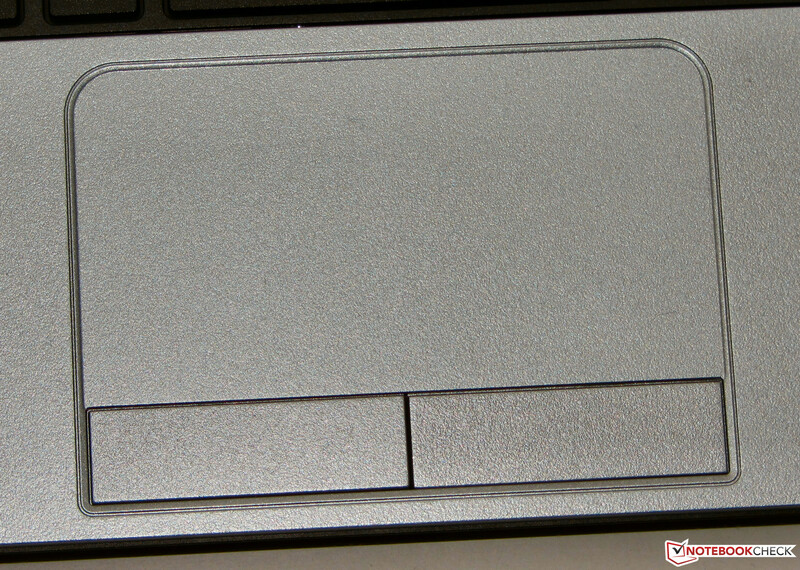 As with its competitors, the ThinkPad Edge and the Aspire, the case is made from plastic. The display lid and the palm rest sport a matte silverish finish with a roughened surface. The rest of the components exhibit a matte black design while only the display comes with a glossy finish. The case appears to be well-built. Only close to the outer edges can the base unit be deformed. Unfortunately, torsion resistance is not its strongest suit. 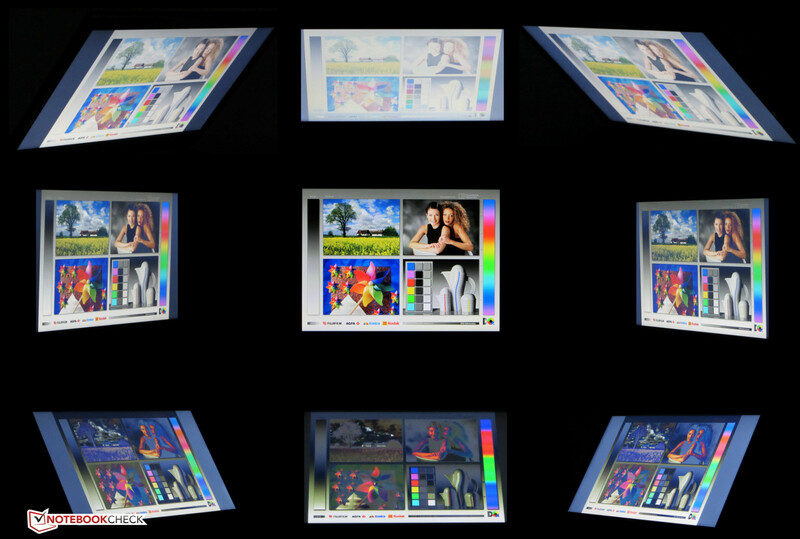 In this regard, the display lid feels a lot sturdier, but if enough pressure is applied on its rear, color distortions do occur. The hinges keep the lid firmly in position, with just a little bit of wobbling. It is not possible to open the lid with just one hand. No major surprises here. Both the Satellite and the ThinkPad Edge ship with USB 3.0 while the Aspire only comes with USB 2.0. The Satellite is the only laptop which sports nothing more than Fast Ethernet (100 Mbit/s) while its competitors are equipped with Gigabit Ethernet. The ports are not well-placed, with some of them being close to the left hand side of the palm rest. 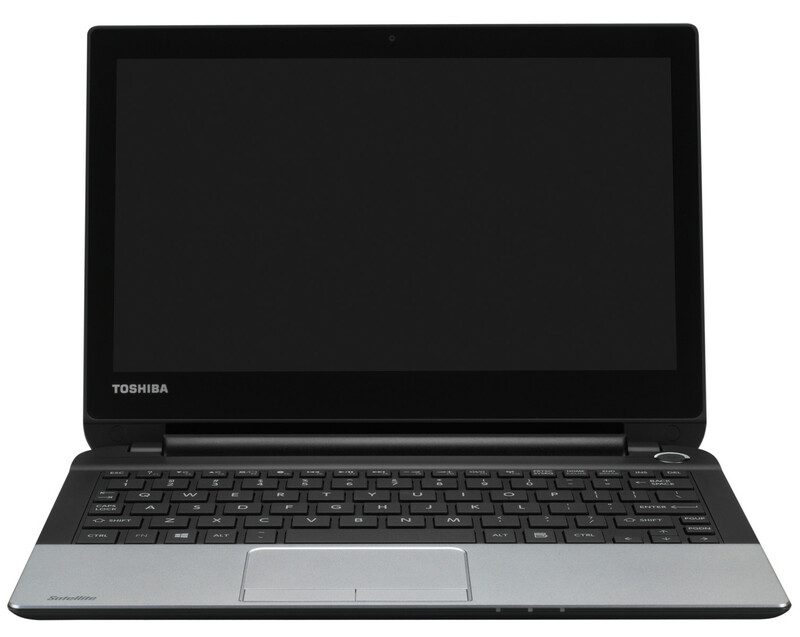 The Toshiba Satellite ships with an Atheros AR9565 Wi-Fi module which supports the Wi-Fi standards 802.11 b/g/n. Signal strength and reception quality are fine, at least subjectively - even in a radius of 15 meters around the router, the connection remained stable at all times, with four out of five bars. The Fast Ethernet chip of the NB10t-A is made by Realtek. In addition, a Bluetooth 4.0 module and an HD webcam (1280x720 pixels) are built into the machine, although the latter won't win any awards due to its graininess. 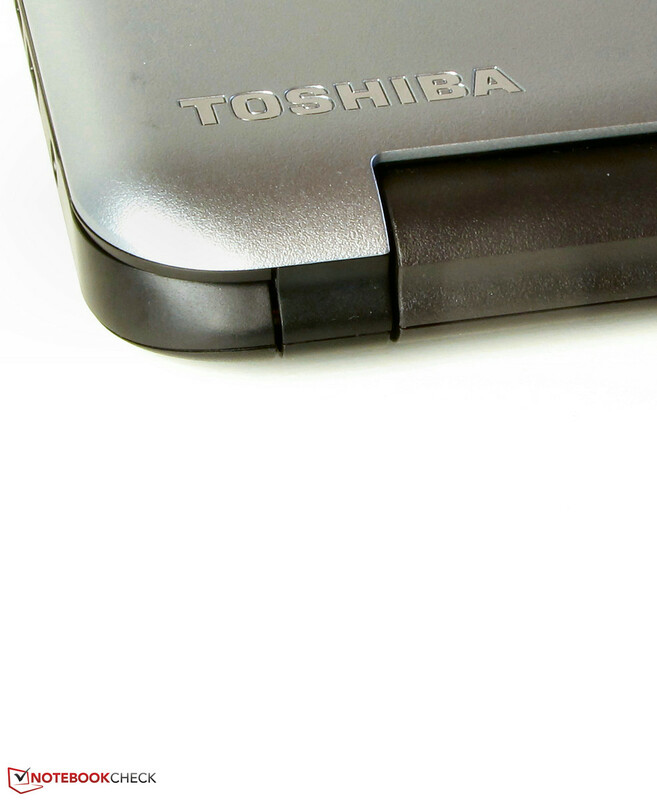 According to a Toshiba press release, the netbook not only comes with the obligatory physical Kensington lock, but also with a Trusted Platform Module. Except for a quick-start poster, only a small warranty and security information brochure are enclosed. The Satellite ships with Windows 8 (64-bit) preinstalled. 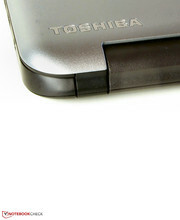 Since no Windows DVD is enclosed, it may be prudent to create recovery media (either a USB flash drive with 16 GB of storage or more, or a number of DVDs, with the help of an external DVD burner) via the preinstalled Toshiba Recovery Media Creator. Beneath the laptop, a small maintenance hatch can be found which makes it a breeze to access the RAM module and the HDD. 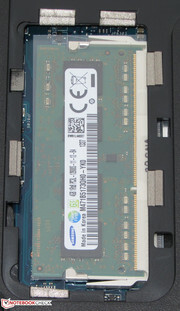 The netbook comes with just one memory bank (which is equipped with the single 4 GB module). Swapping the HDD wouldn't be an issue as long as 2.5-inch hard drives with a height of no more than 7 millimeters are being used. The battery of the Satellite can be removed with the help of a screwdriver (two screws at the back have to be loosened before the battery back can be pulled out). At least in Germany and Austria, the Satellite comes with 24 months of warranty - including pick-up service. Those who purchased the Aspire or the ThinkPad Edge only get the standard warranty of 12 months. 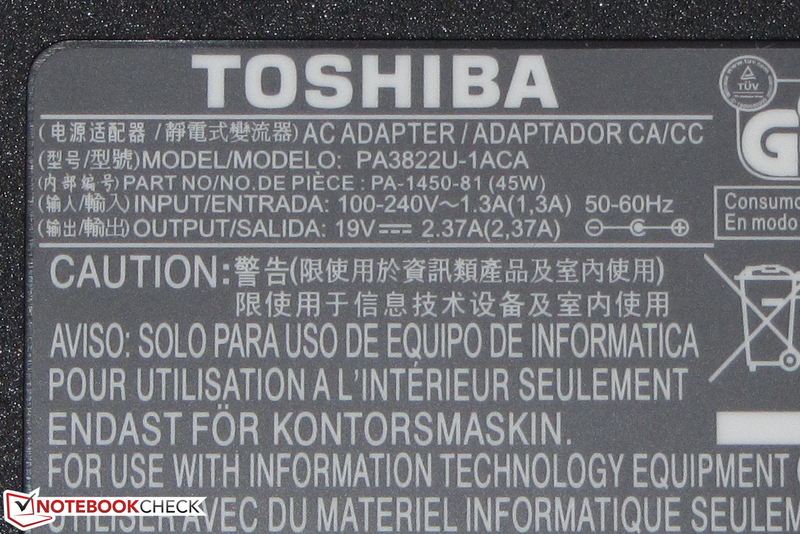 Toshiba even offers warranty extensions for the Satellite. Three years of international warranty cost approximately 65 Euros (~$88). 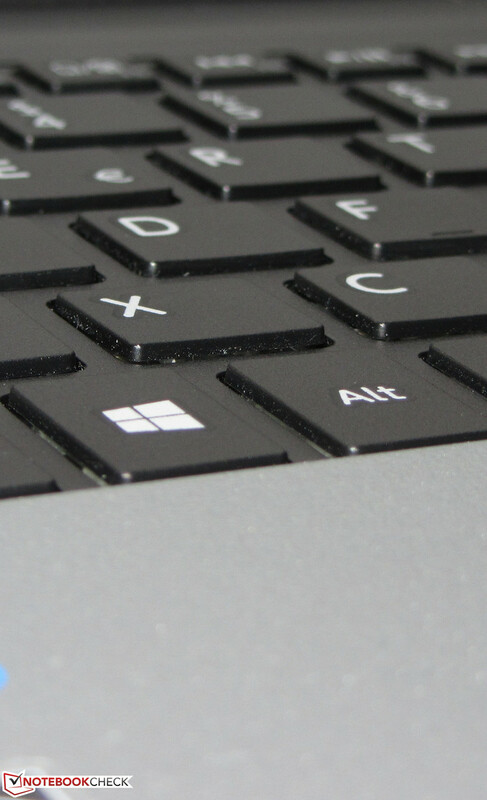 The Satellite comes with a chiclet-style keyboard without backlighting. The major keys are 15 x 12 mm large, with a distance in between of 4 mm. Overall, the flat, roughened keys offer short key travel and a firm pressure point with a decent amount of resistance. The keyboard deck does give in a bit, but not so much as to become a nuisance. 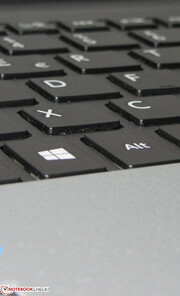 Actually, this is quite a decent keyboard, although it cannot compete with the great one employed by the ThinkPad Edge. The multitouch-enabled touchpad (8.2 x 4.4 cm) comes with the same roughened texture as the palm rest which doesn't have a negative impact on its sliding properties. The different multitouch gestures can be activated and deactivated separately with the help of the configuration menu (not all gestures are activated by default). 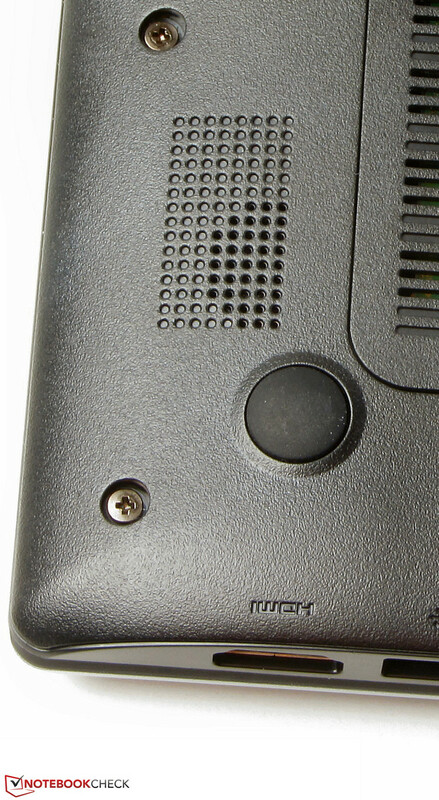 The mouse buttons exhibit a short travel distance and a pressure point which can be identified easily both by its noise and its haptics. 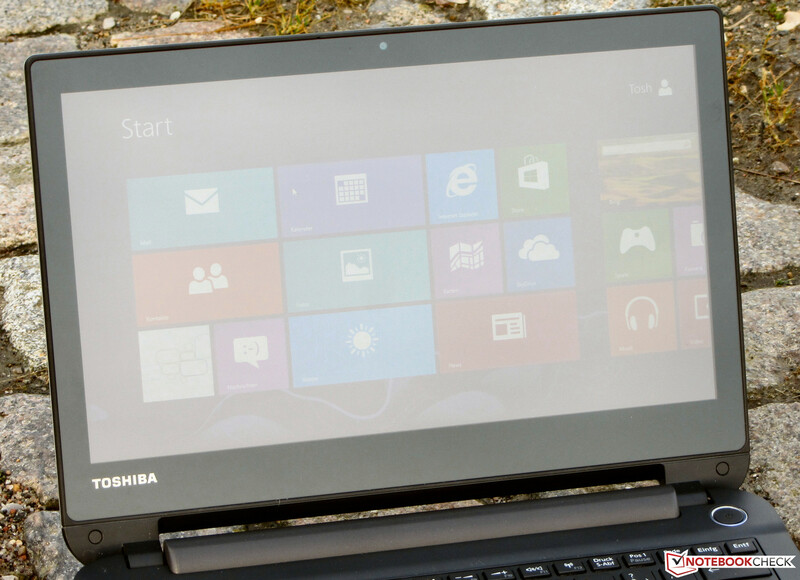 The Toshiba Satellite even comes with a 10-point multitouch screen which didn't exhibit any issues during our tests, always reacting quickly to all of our input commands. The keyboard comes without backlighting. The touchpad supports multitouch gestures. 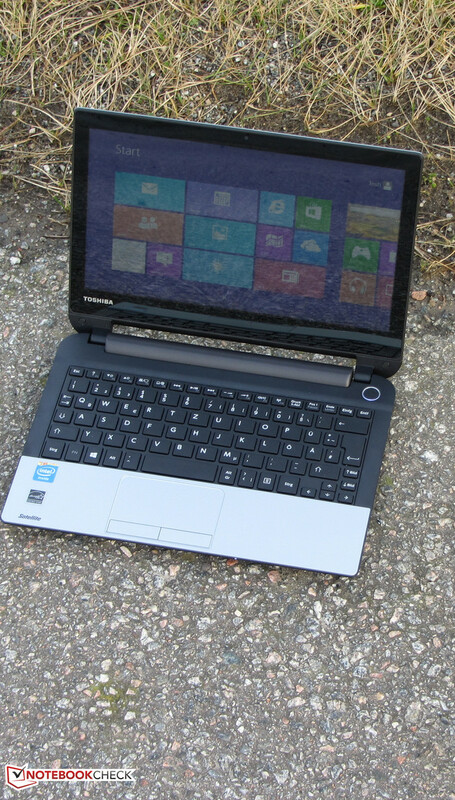 The Toshiba Satellite comes equipped with a glossy 11.6-inch display with a native resolution of 1366x768 pixels. It is rather dim with an average brightness of just 161.9 cd/m², a value which is easily surpassed by both the Aspire (194.4 cd/m²) and especially the ThinkPad Edge (266.1 cd/m²). While the display of the Satellite may not be able to garner any prizes with its brightness, both its contrast ratio (791:1) and the black levels (0.22 cd/m²) are a lot better. Neither the Aspire (444:1, 0.43 cd/m²) nor the ThinkPad Edge (330:1, 0.89 cd/m²) come close. 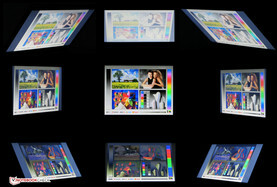 As can easily be seen by taking a look at the graphs below, the display of the Satellite is a long shot away from great color space coverage, reaching 37% of AdobeRGB and 52.8% of sRGB, something which might be an issue if this device were to be used by professional graphics designers and photographers. 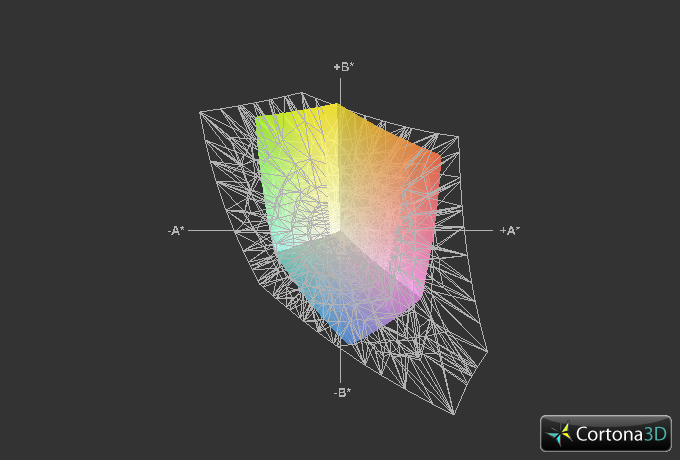 We measured the DeltaE deviations of the color space (target color space sRGB, prior to calibration), leading to an average value of 10.4. This is not good at all, but pretty much common for affordable entry-level laptops. No color comes close to the target area (DeltaE <3). In addition, the display comes with a strongly noticeable bluish tint. 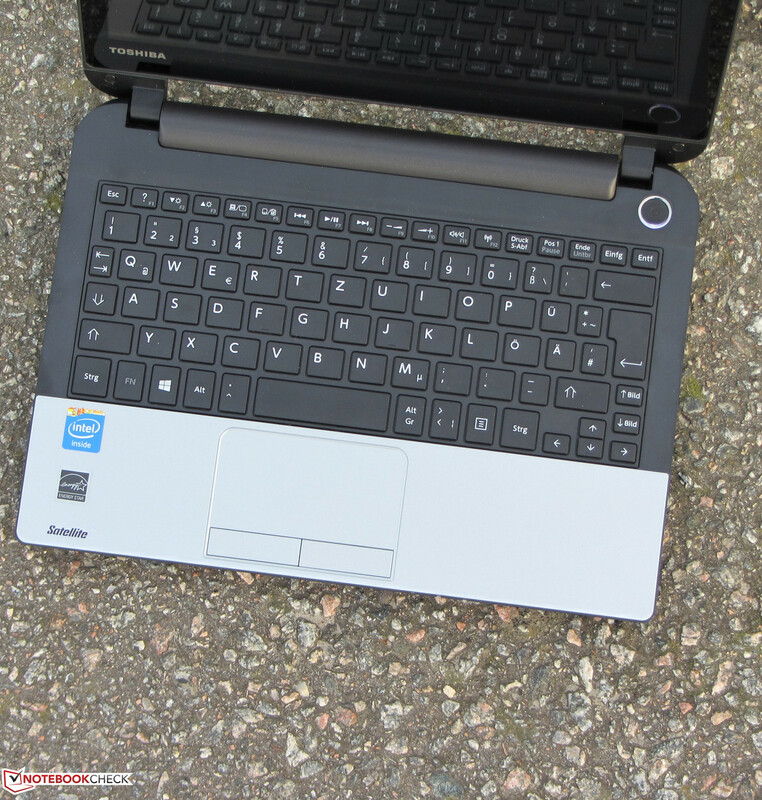 Due to its glossy, dim screen, the netbook is not well-suited for outdoor usage at all. The viewing angle stability of the Satellite comes close to that of most low-prices laptops, with strong distortions in the vertical plane. Horizontal deviations are less of an issue so that more than one person can sit in front of the laptop at the same time. The Satellite during outdoor usage. 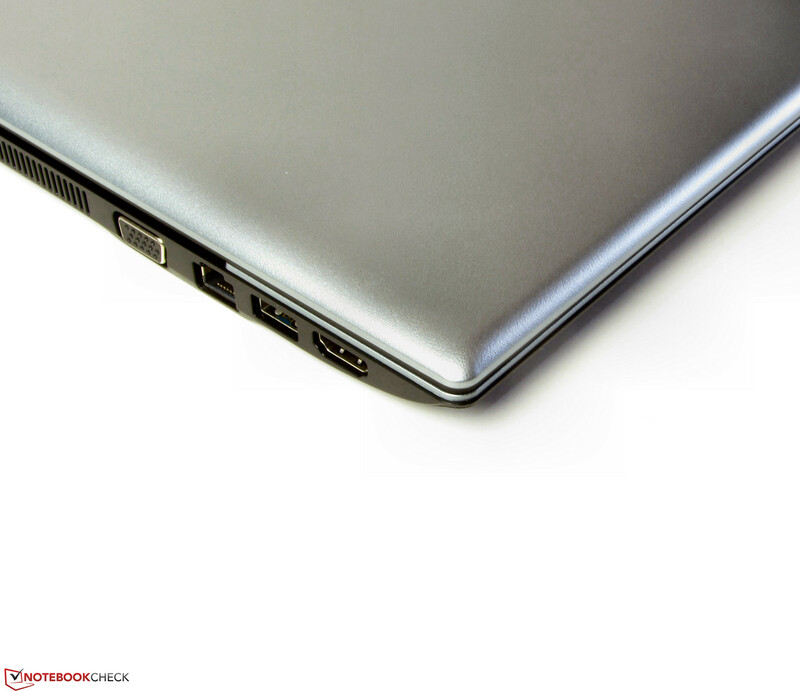 The netbook is perfectly suited for less demanding tasks such as browsing the web, writing an essay or watching videos, including Full HD playback (1920x1080 pixels, H.264 codec). The GPU of the EasyNote comes with a decoder which helps support the CPU during video playback. We found exactly one other variant, the NB10t-A-108 which comes with only 2 GB of RAM. Otherwise, it seems to be identical to our test device, which costs just around 380 Euros (~$518). A model with a Pentium N3510 quad-core CPU will follow, according to Toshiba. The small Satellite ships with an Intel Celeron N2810 dual-core CPU which is based on the Silvermont architecture of the new Bay Trail M platform, just as Intel’s most recent Atom processors. The Celeron CPU has a clock speed of 2 GHz, but no Turbo Boost. With a TDP of 7.5 watts, its power consumption is considerably less than that of both ULV-CPUs and APUs of the Aspire and the ThinkPad Edge. As expected, no throttling occurs during the Cinebench CPU tests. The results of the Satellite are on par with the ThinkPad Edge (AMD E1-2500, Radeon HD 8240), as both CPUs are equally fast (other benchmarks such as Geekbench 3 yield the same results). One shouldn’t forget, however, that the Celeron CPU in the Satellite comes with a higher clock speed, 2 GHz instead of 1.4 GHz and thus wouldn’t stand a chance if tested with the same settings. Both competitors fare a lot worse than the Aspire (Celeron 1017U, HD Graphics (Ivy Bridge)) as its Ivy Bridge Celeron CPU takes the lead by a long shot. The system and the UI run quite smoothly. This is mostly thanks to the rather fast HDD which is being used in the Satellite. Still, sometimes a little bit of lag occurs when switching between open applications or when loading the contents of a folder. But as long as not too much stress is exerted onto the netbook, everything works fine. Similar results hold true for the PC Mark benchmarks. 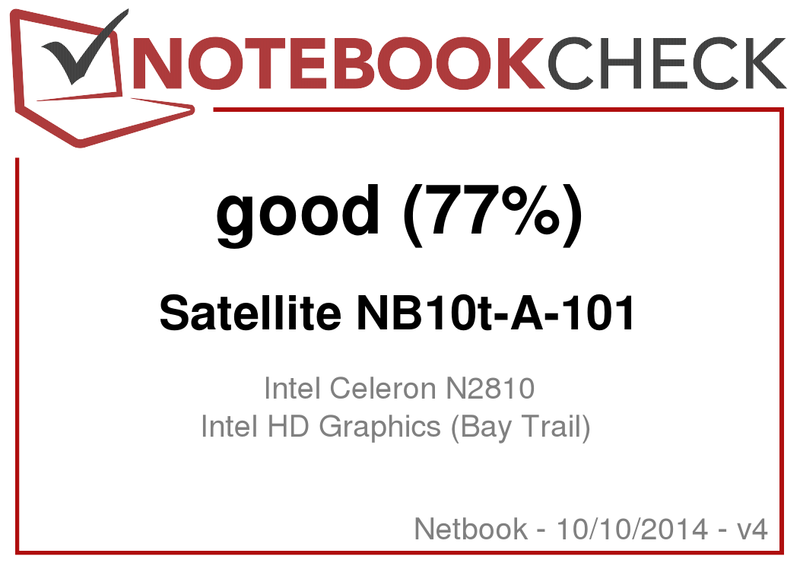 Unsurprisingly, the Aspire (Celeron 1017U, HD Graphics (Ivy Bridge)) comes out on top again due to its much more powerful CPU, but the Satellite does manage to beat the ThinkPad Edge (AMD E1-2500, Radeon HD 8240), partly because its HDD is faster and partly because Intel CPUs tend to fare better in this particular test scenario. Installing an SSD might lead to a noticeable boost in terms of performance, both during system start and concerning responsiveness once it is up and running. In addition, the results of the PC Mark benchmarks would increase as well. We have actually tested such a scenario, installing a Crucial RealSSD with 64 GB. The result: Our PCMark 7 score went up by almost 65% to 2485 points. The Satellite comes with an HDD manufactured by Toshiba itself, with 5400 rpm and a capacity of 500 GB. According to CrystalDiskMark, the average read speeds come to lie around 115 MB/s, with data transfer rates of around 87.8 MB/s according to HD Tune. These results are actually quite a bit better than what we might have expected for an HDD with 5400 rpm, especially one which is being used in a netbook. The HD Graphics GPU of the Satellite supports DirectX 11 and clock speeds of 400 to 756 MHz. It falls behind both of its competitors in all 3DMark benchmarks, while both the ThinkPad Edge (AMD E1-2500, Radeon HD 8240) and the Aspire (Celeron 1017U, HD Graphics (Ivy Bridge)) end up being more or less on par (with one taking the lead in some of the tests and the other in the rest). Still, nominally, the ThinkPad Edge ships with the strongest GPU, as can be seen by taking a look at the 3DMark 2011 results as well as the GL tests of the Cinebench benchmarks where the CPU is not as important as in most other benchmarks. Ultraportable notebooks and netbooks tend to lack the graphical prowess necessary to power modern 3D games. A few games remain playable, however, at least at low resolutions and with reduced quality settings. This list includes TrackMania Nations Forever, StarCraft II: Heart of the Swarm and World of Warcraft. Games from the touch-centric Windows Store, however, work flawlessly. 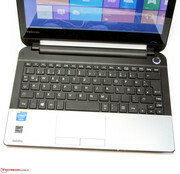 Those who are looking first and foremost for a quiet notebook would be very happy with the Satellite. The device remains almost completely silent no matter the workload. Next to the usual background noise of a mechanical HDD, nothing can be heard at all since the fan isn’t rotating. While idle, 31 to 32.5 dB(A) can be measured – which is actually a little bit more than what both the ThinkPad Edge (30 to 31.4 dB(A)) and the Aspire (29.8 to 31 dB(A)) have to offer. However, this value doesn’t change at all, no matter whether the device is put under medium (3DMark06) or full load (stress test with Prime 95 and Furmark running simultaneously): 31 dB(A), as much as what we measured during idle mode, and noticeably less than both competitors, the ThinkPad Edge (32.8 and 35.1 dB(A)) and the Aspire (32.3 and 32.6 dB(A)). Actually, we aren’t even certain any more whether the Satellite comes with a fan at all. The Satellite NB10t-A-101 during the stress test. While idle, none of these laptops tend to get noticeably hot, with decent surface temperatures all around. Even under load, the situation doesn’t worsen too much. Still, the ThinkPad Edge (no more than 30 °C at any location) fares a lot better than the Satellite, which does manage to exceed 40 °C at a number of different points – the price Toshiba has to pay for its low noise emissions. During our stress test (Prime95 and Furmark running for at least one hour), no difference can be noted between the laptop running on battery and while the power adapter is plugged in. The CPU speed fluctuates between 1.6 and 2 GHz at the beginning, with less and less spikes towards the top, reaching a plateau around 1.6 GHz after some time. The GPU starts at full power (756 MHz), but it does get slowed down to 711 to 733 MHz at a later point in time. The CPU temperature remains at a constant level of 68 °C when the laptop is plugged in. 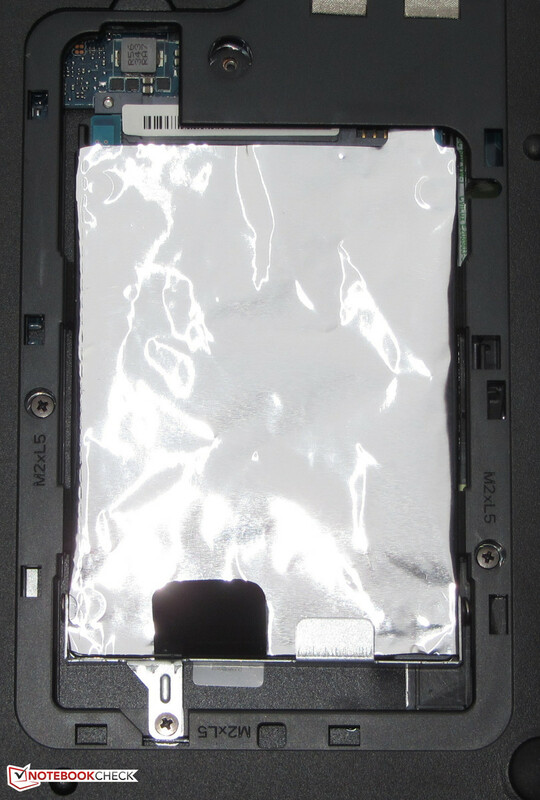 (±) The average temperature for the upper side under maximal load is 35.1 °C / 95 F, compared to the average of 29.8 °C / 86 F for the devices in the class Netbook. (±) The maximum temperature on the upper side is 40.6 °C / 105 F, compared to the average of 33 °C / 91 F, ranging from 21.6 to 53.2 °C for the class Netbook. (+) In idle usage, the average temperature for the upper side is 28.3 °C / 83 F, compared to the device average of 29.8 °C / 86 F.
The stereo speakers of the Satellite are located at the front of the lower part of the base unit. Their flat, tinny sound without any bass is unsatisfying although speech can be understood clearly. Those who want to watch a movie on the Satellite might want to invest in good headphones or external speakers instead. While idle, the Satellite requires between 6 and 7.6 watts, more than both the ThinkPad Edge (4.2 to 6.3 watts) and the Aspire (4.5 to 7.3 watts). 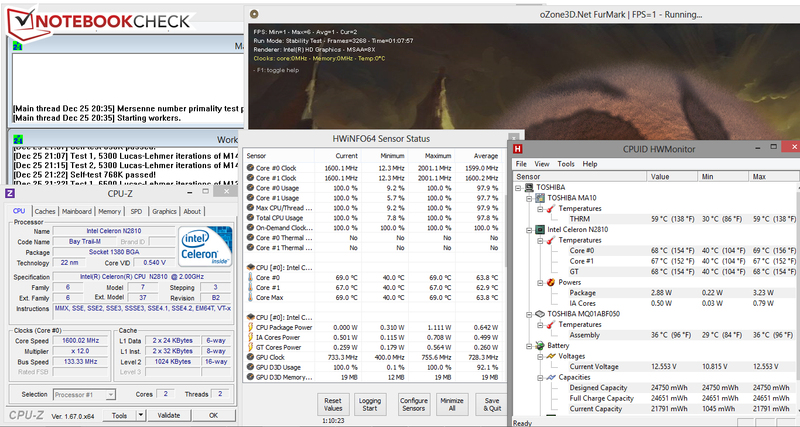 Under medium load (3DMark06 is running) or full load (stress test, Prime 95 and Furmark are running), the power consumption barely increases at all, reaching 9.5 and 12.6 watts respectively. Since the TDP values of both competitors are twice as high as that of the Satellite (15 watts instead of 7.5 watts), it shouldn’t come as a surprise that they require a lot more power at 14.9 and 20.1 watts (ThinkPad Edge) or 20.3 and 24.7 watts (Aspire). While idle, the battery runtimes of the Satellite are much weaker than that of its competitors, reaching no more than 5:20 h while the Aspire (12:15 h) and the ThinkPad Edge (19:43 h) clock in at much higher values. These measurements are performed with the Battery Eater Reader’s Test, with the screen set to its dimmest brightness level, the energy saving mode activated and the radio modems turned off. Under full load, the Satellite manages to survive for 2:05 h which, again, is a lot less than what both the ThinkPad Edge (4:01 h) and the Aspire (3:49 h) have to offer. Here, the Battery Eater Classic Test has been employed, increasing display brightness to its maximum value, turning on the high performance profile and activating all radio modems. The Wi-Fi test, the most life-like scenario, where a new webpage is loaded every 40 seconds, the energy saving profile is active and the display brightness is set to approximately 150 cd/m², yields a value of 2:52 h. Again, this doesn’t even come close to the results of both the ThinkPad Edge (8:19 h) or the Aspire (5:52 h). Video playback, as tested with a looped version of the short film Big Buck Bunny (H.264 codec, 1920x1080 pixels), results in a battery life of 3:11 h. This test, where the energy savings profile is turned on, the radio modems are deactivated and the display brightness is set to 150 cd/m², has not been performed with both of the Satellite’s competitors. We are quite disappointed by the battery life of the Satellite, as we would expect a much better result from such a power-efficient device. Then again, the results shouldn’t come as a surprise, since the battery capacity is miniscule at 24 Wh. Both the Lenovo (63 Wh) and the Acer (56 Wh) offer at least twice as much, without being heavier. 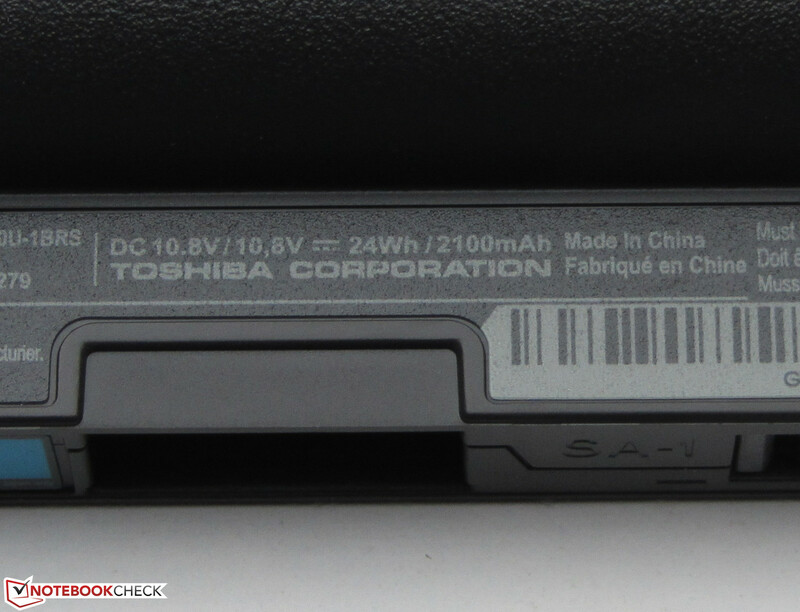 The ThinkPad Edge is a logical candidate for the top spot, as it sports not only the largest battery, but also the lowest energy consumption rate in idle mode. 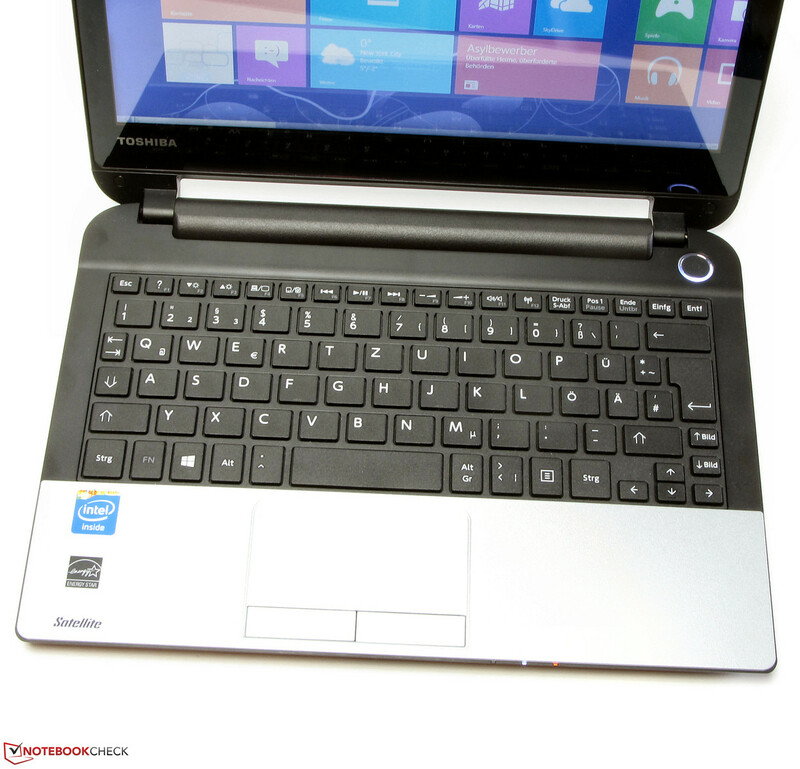 The Toshiba Satellite NB10t-A-101 offers more than enough performance for all netbook-related tasks, ranging from web browsing, Skype calls and video playback to writing tasks. Fortunately, the device remains almost absolutely silent at all times, even under full load. 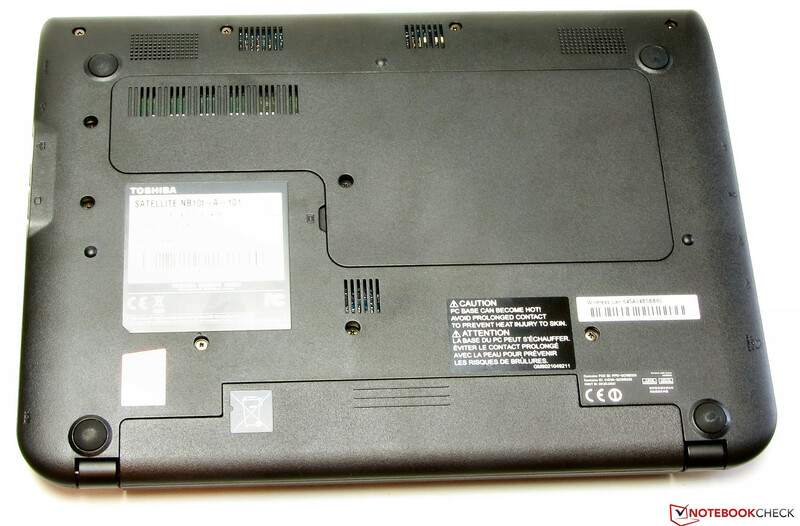 At the same time, the netbook is pretty power-efficient, and it comes with an unusual 24 months of warranty. While the display is pretty dim (not to mention the bluish tint! 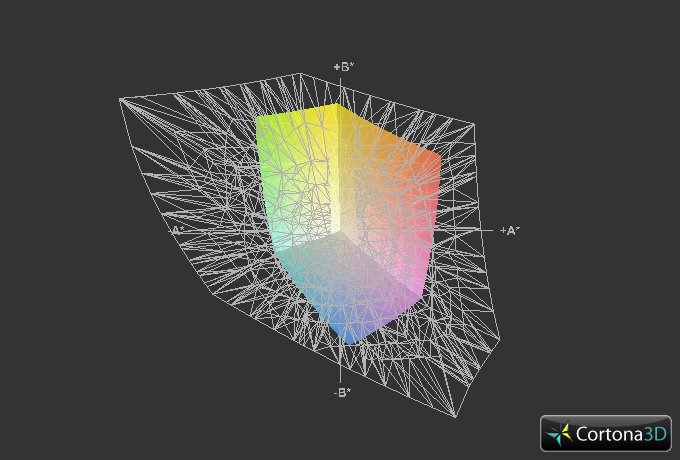 ), it does at least offer a great contrast ratio. In a press release, Toshiba claims that the NB10t-A-101 is ideally suited for using it on the road, thanks to its low weight of just 1.5 kilograms. In addition to the fact that 1.5 kilograms is not even that light for an 11.6-inch device, weight is not the only major criterion for outdoor usage. Due to the dim display and the bad battery life (because of the extremely small battery capacity of just 24 Wh, barely more than that of some 8-inch Windows tablets), its usability in these scenarios is severely limited. When compared to the Acer Aspire V5-131 and the Lenovo ThinkPad Edge E145, the Satellite comes out on the short end. Those looking for an 11.6-inch device should stick to one of the competitors. The ThinkPad offers the same performance as the Satellite while at the same time trumping it in terms of battery life, keyboard quality and by its bright screen with a matte finish - all of that for around 370 Euros (~$504), or 320 Euros (~$436), if Windows 8 is not a requirement. The Acer Aspire, however, offers much more CPU performance as well as better battery life. In addition, it turns out to be the cheapest of these devices at just 300 Euros (~$409). Again, a variant without Windows can be purchased for 50 Euros (~$68) less. ...but it comes with just one RAM module. The HDD can be swapped. 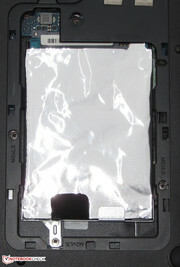 Two screws have to be loosened before the battery can be removed. The battery capacity is 24 Wh. The power adapter weighs approx. 194 grams. It delivers up to 45 watts. The keys offer short travel. The speakers are located beneath the base. The Satellite, being used outdoors. The low power consumption, the almost non-existing noise emissions and the long warranty period. A brighter screen and a (much) larger battery. 24 months of warranty? That is almost unheard of for a budget device. Acer Aspire V5-131, Lenovo ThinkPad Edge E145, Medion Akoya E1317T (10-inches), Packard Bell EasyNote ME69BMP (10-inches), HP Pavilion TouchSmart 11-e000sb, Lenovo IdeaPad S210 Touch 20257, Acer Aspire V5-122P-61454G50NSS, Lenovo ThinkPad Edge E130 NZUAXMB, Lenovo ThinkPad Edge E135, Acer Aspire One 725-C7Xkk, Asus VivoBook S200E, Acer Aspire One 756-B847X, Asus Transformer Book T100TA-C1-GR (10-inch convertible).